Kevin King knew the importance of a good start. In this March 1989 game for the University of Oklahoma, King threw a complete game, according to The Oklahoman. King gave up four hits and recorded his third victory on the year in the 9-1 Oklahoma win, The Oklahoman wrote. "I knew I had to come out and have a good game, try to go all the way," King told The Oklahoman. "A lot of times it seems if one pitcher goes out and does a good job, it's a chain reaction with all the other guys." King went on from Oklahoma to turn pro. He then pitched enough good games to make the majors over three seasons. He got into 34 total games in relief for the Mariners, playing his last game in 1995. King's professional career began in 1990, taken by the Mariners in the seventh round of the draft out of the University of Oklahoma. At Oklahoma in April 1989, King picked up another win through the mercy rule, a 15-4 victory over Kansas. "It's nice, it's something to look forward to," King told The Oklahoman after the six-inning victory. "I love it, but you can't plan on it, you've got to go out there and throw the ball." King started with the Mariners at short-season Bellingham and high-A Peninsula. He went 7-4 overall, with a 4.61 ERA. He returned to Peninsula for all of 1991. He threw a two-hit shutout against Durham. He went 6-7 over 17 total starts, with a 4.37 ERA. King then played 1992 at high-A San Bernardino and 1993 at high-A Riverside and AA Jacksonville. That September, he debuted in Seattle. King got into 13 games for the Mariners down the stretch in 1993. He gave up eight earned in 11.2 innings of work while he picked up one loss. He returned for another 19 relief outings in 1994. He went 0-2, with a 7.04 ERA. 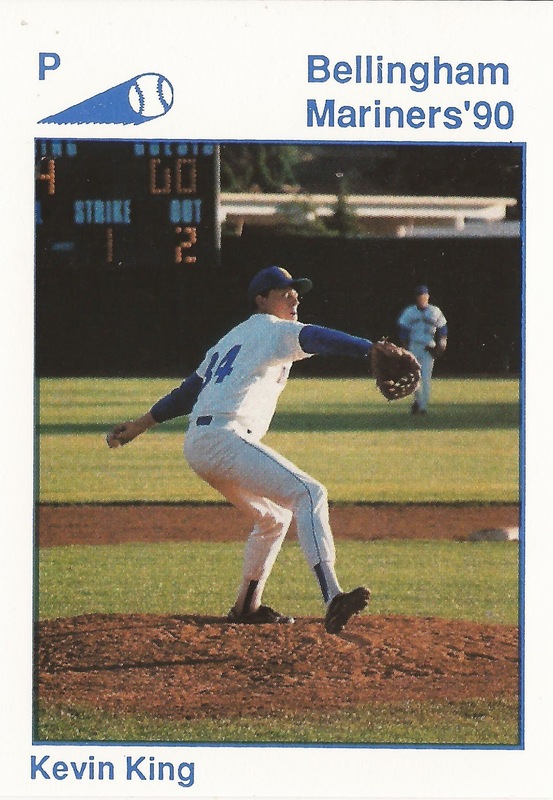 He then picked up two final outings with the Mariners in 1995, while he played the rest of the year at AA Port City and AAA Tacoma. King saw his final time in 1996 at independent Amarillo. He gave up seven earned in 4.1 innings of work to end his career.